All of us have been victims of coincidences. There's a million stories every day. Like the one where you're humming a tune, and as you turn on the radio... That never happened to me. But something did happen. I bought a fancy watch in Vienna, one that not only showed the time of day, but all kinds of other measurements as well. One of the things my watch measured was altitude. I just needed to set the watch according to some known level, like the sea level equals zero. Not very convenient in land-locked Austria. I had a problem. Just then I happend to look about, and there, at my feet was a rock with the altitude hewn into it. What do I know, perhaps the Austrians have strewn such rocks all over the place. I just happened to notice this one the second I needed it. Of course I can't prove any of this. So, here's a story about a coincidence I can prove. In fact, if I did't have the evidence, there would be no story to tell. I grew up with this fascinating oil painting on the living room wall. On the painting there are somme people in the foreground, behind them there is a merchant vessel with furled sails and a mighty tower, a banner fluttering from its rounded top. Had all this ever been real? Was it pure imagination, or a so-called "artist's impression"? All my mother could tell me was that the painting had been part of a frieze, decorating the home of a rich merchant in Marseilles. A coincidence always comes in two parts. Here comes the second part. As my wife and I were "doing" Europe in an off-season vacation, I got the screwball idea that we should hop on over to the home of Hannibal, since I'd always been a fan of his. In order to do this, we had to catch a ferry from Marseilles to Tunis. The key word here is Marseilles. 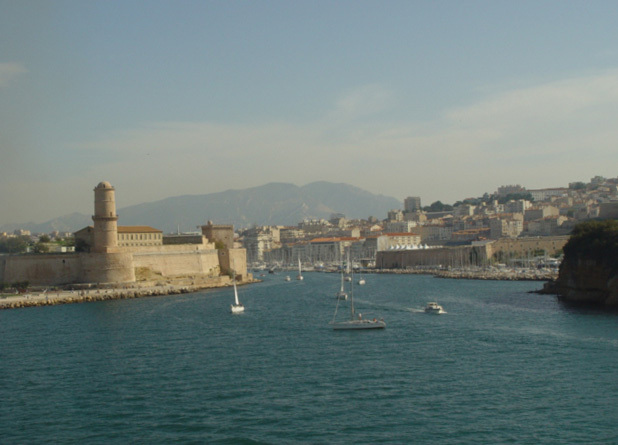 I didn't notice the similarly while I was photographing the tower in the Marseilles' harbour. The realisation came slowly as I studied the pictures I had taken from the aft deck of the ferry. I don't think I would have discovered the tower from any other angle.